Refreshingly sturdy, this vivid pitcher brings water, lemonade and summer sangria to life through recycled glass. Building on slight tint from re-purposed glass, artisans carefully steep each piece in azure gradients to create its "ombre" shading. Handmade in Mexico. Due to the hand-crafted process, the texture of each item will differ. Air bubbles and small "imperfections" add individual charm to each one-of-a-kind piece. This was purchased by the class as an end of year teacher's gift. The teacher's focus this year w/ the class was on recycling and saving the environment, so this was a perfect gift! The kids were thrilled to learn that this carafe was made from reused automobile glass! It has unique imperfections which only adds to its beauty! For the money it's a good pitcher. 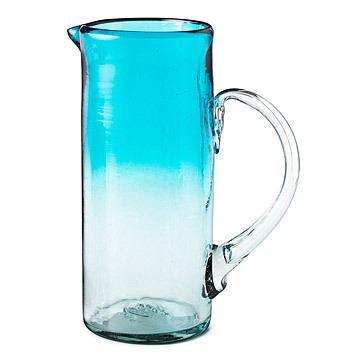 Refreshingly sturdy, this vivid Ombre Water Pitcher brings water, lemonade and summer sangria to life through recycled glass.